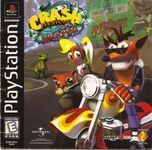 The game's story takes place immediately after the events of its predecessor Crash Bandicoot 2: Cortex Strikes Back. The ruins of a space station called the Cortex Vortex owned by the series antagonist, Doctor Neo Cortex, crash-lands on Earth and unleashes an evil entity known as Uka Uka, who collaberates with Cortex and the time-obsessed Doctor Nefarious Tropy to gather powerful Crystals in their original places in time. The game follows the main characters Crash and Coco Bandicoot as they travel through time and prevent the villains from gathering the Crystals by collecting them themselves. Source: Wikipedia, "Crash Bandicoot 3: Warped," available under the CC-BY-SA License.